Fanny Adam, a student at École nationale supérieure des Arts Décoratifs (EnsAD) in France, used Elegant Oak from the Formica® Woods range for her final project study: a new object that meets current needs. Following the brief, Fanny designed a sofa that successfully overcomes challenges linked with lack of space in urban dwellings. Featuring Formica® laminate, this convertible piece of furniture serves not only as a sofa and a bed; it also includes a table which provides customers with additional work and dining area. “There were many reasons why I chose Formica® laminate for my project. 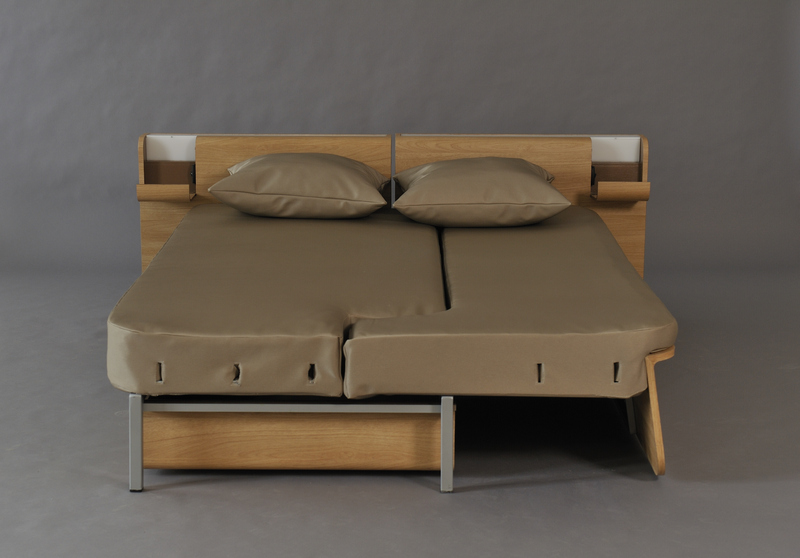 It was perfect for the armrests (which become a headboard when the sofa is transformed into bed), drawers and the table. 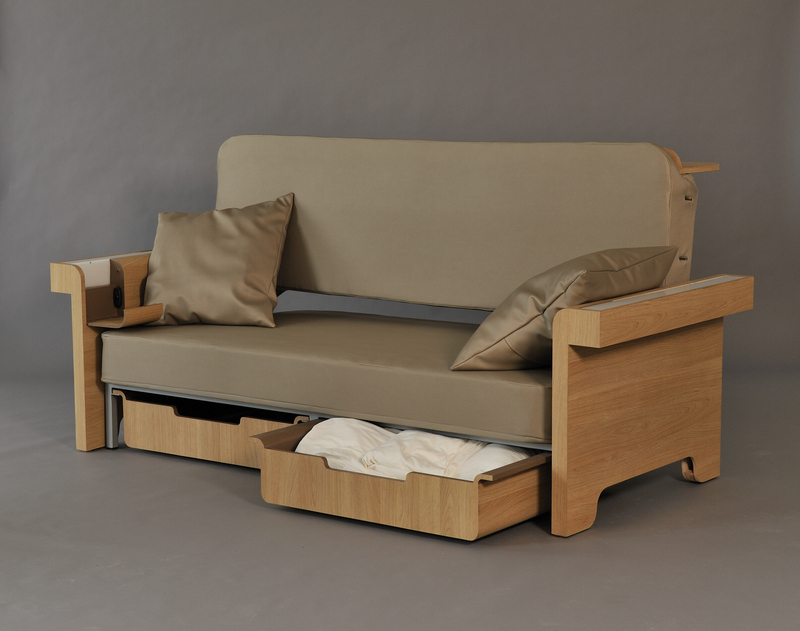 As the sofa bed becomes an indispensable and most important part of the household, a place where customers work, relax, eat and sleep, the material had to be able to fulfil all the demands of such usage,” comments the designer. Formica HPL is an ideal material for furniture making; it is durable, resistant to heat and scratches and keeps it looks while requiring minimal maintenance. “Formica laminate also offers an incredible choice of colours and finishes and I felt this was an important part of the design. 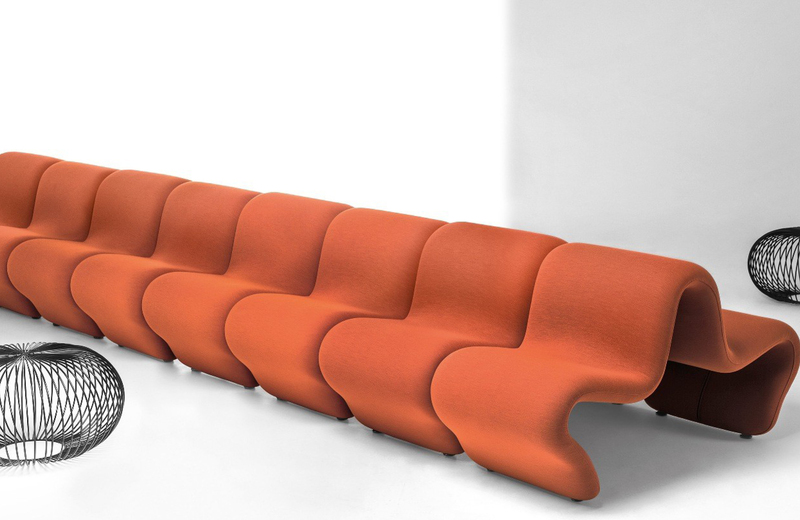 I wanted the sofa to be not only practical, but also on-trend,” Adams adds. Fanny used Elegant Oak with Naturelle™ finish designed to enhance the realism and appeal of woodgrains. She goes on to say: “For my prototype I wanted a material that would be just like wood from both visual and tactile point of view and was also cost efficient.” Naturelle’s matte, velvety feels creates an elegant finish which emulates the look and feel of smoothly-planed waxed timber and complements straight-grained or softly-planked wood. Robust and easy to clean, Formica HPL can be used horizontally or vertically and can hold a curve to create striking feature. Formica Woods are part of the Formica® Collection which provides architects, designers and specifiers with a harmonized portfolio of decorative laminates. It includes plain colours, patterns and textures with extensive colour families and coordination between ranges. Working closely with architects, designers and specifiers, the company is ideally placed to offer innovative new products and decors which respond to market needs and complement current design trends. In depth product development and advanced technology enables Formica Group to create exclusive products that inspire and excite the market. With 99 years of innovation and manufacturing experience, Formica Group has developed an unrivalled expertise, which ensures quality, reliability and products that are fit for purpose.